This is how my hosts and I celebrated after my final talk in Zagreb (the topic was our lack of free will, and it was delivered at the University of Zagreb’s philosophy lecture hall). 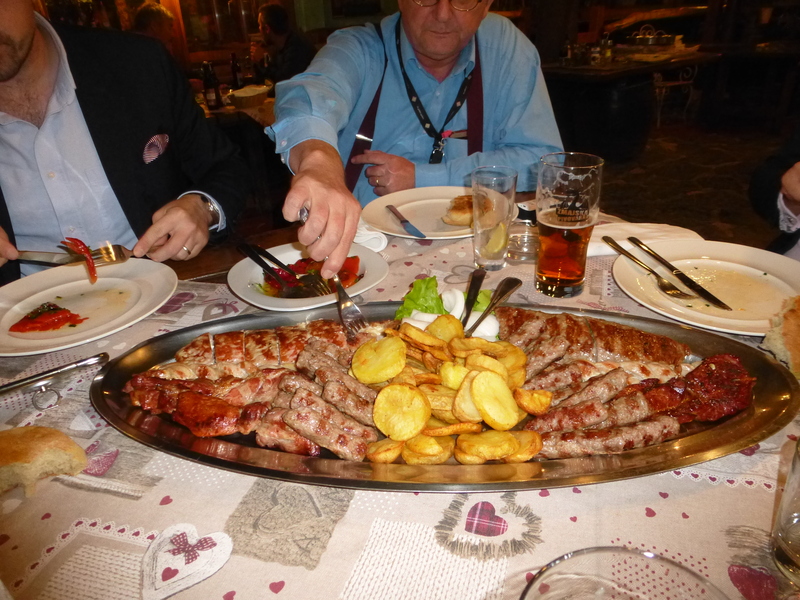 Voilà: the Giant Meat Platter, designed to feed six, preceded with pickled red peppers and flatbread, washed down with beer, and finished off with dessert and slivovitz (the local plum brandy). My hosts hastened to tell me that they don’t always eat like this, and I hasten to tell you that I don’t, either. This is Traveling Food. But it sure was good! This entry was written by whyevolutionistrue and posted on October 18, 2018 at 1:15 pm and filed under food and drink, travel. Bookmark the permalink. Follow any comments here with the RSS feed for this post. Both comments and trackbacks are currently closed. Looks like something Da Bearsss fans would eat on SNL. Come to think of it, I bet some of those guys were Croatian-Americans. OMG. Wish I coulda been there for that meal. Well, the talk too, but that meat platter . . . They can talk, we’ll eat. You’re right. I should not have mentioned the meat. It was a tactical error. If there is no free will, why do people respond differently to the exact same stimuli? Are the determinists claiming we are all programmed to respond as we do, uniquely? Essentially yes, the response is considered an emergent property of a complex series of inputs (genetic, environmental, experiential)over a lifetime. That meat platter made my mouth water, my vegetarian mother would probably have a different response. Yes. How on earth could that possibly pose a problem? Given that the “programming” is everything each individual has experienced since conception how could you suppose that anyone could possibly have the same programming as someone else? Rather, it is impossible for any two people to have the same “programming,” even identical twins. Must have taken two to carry that to the table. I’m on a diet, but put a spread like that in front of me and I would admit I do not have free will. These food posts have been great. I have a running list of places I want to go (to eat!) and Croatia just jumped up quite a bit. I love the implication that the greens for this meal amount to maybe a third of a lettuce leaf each; and the carbs are perhaps three saute spuds each. That’s getting your priorities right! Many years ago I consumed a large quantity of slivovitz one night. But then it was called Yugoslavian peach brandy. Funny how booze outlives politics. Typical 3–4 nose tackles are “big wide bodies who can hold the point of attack and force double teams by the guard and center.” They are usually the heaviest players on the roster, with weights ranging from 320 to 350 pounds (145 to 159 kg). Also, height is critical, as they are supposed to get “under” the offensive line, which means ideal 3–4 nose tackles are no taller than 6 ft 3 in (1.91 m). Recent examples of such nose tackles include Gilbert Brown, Casey Hampton, Jamal Williams, Vince Wilfork, and Damon Harrison. Rather uncommon are taller nose tackles, such as Ted Washington and Ma’ake Kemoeatu, who each won a Super Bowl ring are both 6 ft 5 in (1.96 m) tall. It was the cat, just trying to plant the seed…. Jerry, what are the meats? As I was told, two kinds of sausages, pork steak, minced beef, and (I think) chicken. That is no country for old vegans. Feed 6? I should think that divided up for 30 people would have provided a sufficient daily dose of animal protein. What are the yellow objects in the middle? Potatoes? It was empty at the end of dinner. 1) Wouldn’t it be amazing if a small family of Neanderthals joined you for dinner. 2) Are mostly men excited about a meat serving like this? Are the women waiting for the vegetables to follow? This was an all-male group: the four professors who hosted me and the Croatian publisher of my books. *drooling over meat platter* Let’s not be sexist about this. My wife and daughter like Brussels sprouts and kale. To me, they are just this side of fatally toxic. I’m actually less a meat fan than fish. Ya gotta cook the brussels sprouts right, i.e. roasted in the oven or in a pan with lots of garlic and lemon and a little balsamic vinegar and brown sugar. The mushy kind are abysmal. This is like a dream. I want to live in this dream.